I hope to have this completed by the end of the weekend, and then I’ll post a full story with pictures of the finished project. Until then I thought I’d sate your curiosity with some pictures of the Phase 2 Prototype. From these pictures you can see the design changes that have been made since the last pictures I posted. I’ve added a stand to get the structure up, off the table. This is to elevate the playing surface as well as give me room to mount the output and volume pot for the pickup (when it arrives). I’ve also added a second bridge to get the turnbuckles up, off the board, in an effort to eliminate rattling. 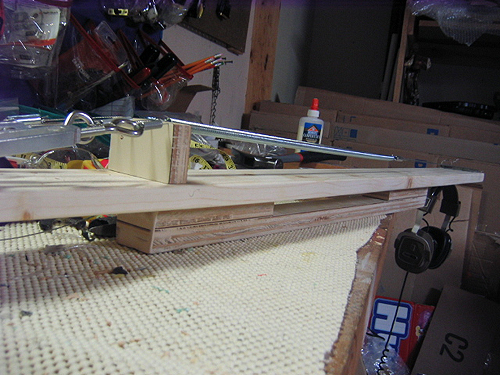 This bridge may end up being too high, but I won’t know until I get the pickup and start installing it. 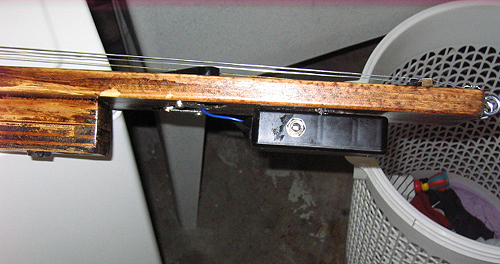 I’ve also replaced one of the strings with a string/spring combo for some spring reverb effects. 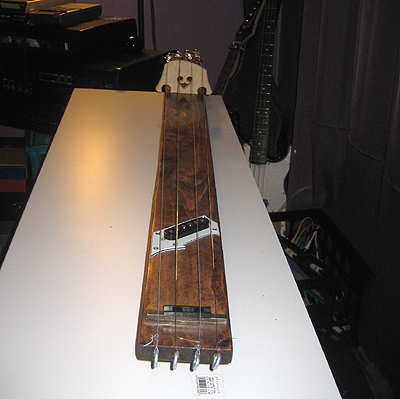 So far I’m not as happy with that as I’d hoped, but I’m optimistic it will sound better when amplified by the pickup. As it stands, I’m really happy with the flexibility of the instrument. 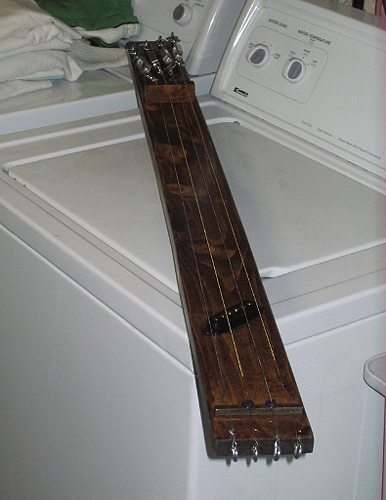 In its current, unamplified, form I’m getting great tones plucking and playing as a percussion instrument – smacking with one hand and muting with the other. But it didn’t really start to shine until I took a bow to the strings. If it sounds half as good amplified as it does now, I’ll be getting A LOT of use out of this little bugger. This all began about nine years ago. I had just recently purchased Pigface’s A New High In Low and had been thoroughly enjoying the new sound. In many regards I was a late adopter in those days. I hated computers and my experience with the internet consisted solely of getting really out-of-my-mind at my friend’s house, and then trolling AOL and Yahoo chat rooms. My mother is something of an anomaly, in that she bought a computer and had internet access long before it was reasonable for her to have done so. Even though I couldn’t stand computers, I had a knack for troubleshooting, and so I often found myself out at my mother’s house sussing out what was wrong with her system and eventually took to using the internet for research. It was around this time, while researching Invisible Records and Pigface, that I first stumbled on the website of Matthew Schultz and read about his ATG (Anti-Tank Guitar)*. 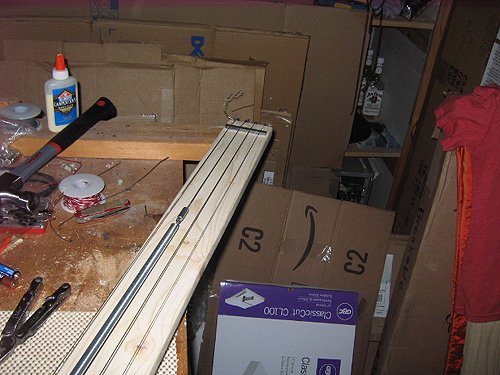 I was immediately enthralled and began making grand designs for my own version. It really goes without saying that my attention deficit disorder proved to be a massive hindrance in these plans, but a seed was planted. Hrm.. Well, it was less like a seed and more like a wound that festered over the years. 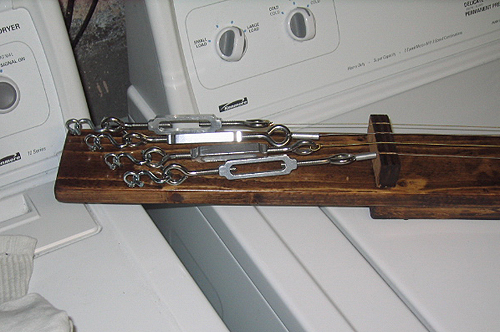 More than once I tried to make my own ATG, but my woodworking skills were subpar, at best, and I abandoned each project before getting far enough to even test the design. This is quite a rambling backstory, so let’s fastforward to the summer of 2007. For those of you keeping track, that’s the present. After completing a project wherein I abused my bass guitar with a Dremel tool, I started having concerns about taking things too far and damaging my bass. While its incredibly rare that I actually use my bass for its intended purpose, I still enjoy having that opportunity available should the desire arise. So I decided I’d need something to replace the bass guitar for such nefarious, and potentially dangerous, needs. And thus that ancient wound began aching and its pain again entered my consciousness. Determined to once and for all rid myself of this cursed urge, I steeled my resolve, grabbed the Visa card my bank mistakenly granted me and set out for the local Home Depot. I returned with a plank of wood, some wire, turnbuckles and eye hooks, and a dream was born. Over the past week I’ve been prototyping and refining my design and tonight I’ve finished building my very first ATG. My ATG Mini is probably little more than half the size of the behemoths that Schultz uses, but I wanted to make a tabletop version that could easily be accommodated in my workspace, and could easily be transported for live performances. 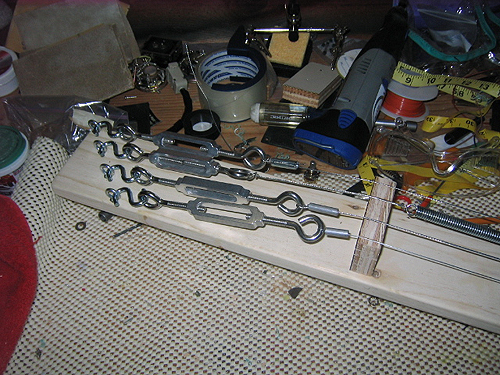 My early attempts at creating an ATG used normal bass or guitar tuning pegs. I opted to dispense with this foolishness and go with the far cheaper turnbuckles. 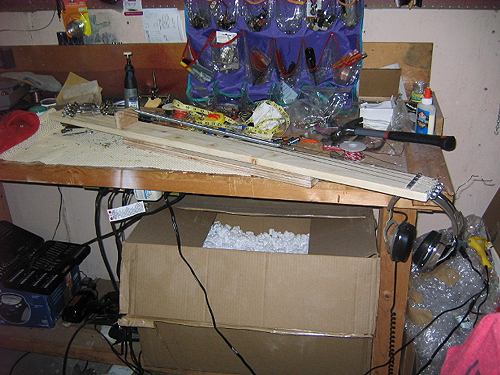 This seriously reduced planning time, as I wouldn’t have to mount the tuning pegs, and gives me the freedom to expand to other, less traditional, string configurations. 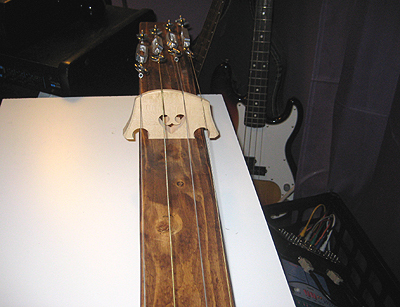 Here you can see the shorter bridge and the extensions I installed to raise the middle strings for easier bowing. 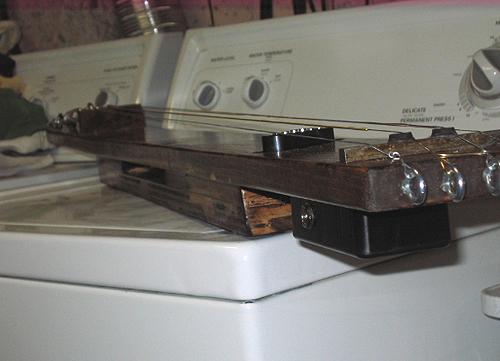 Ideally I would have liked to use an upright bass bridge, but this was far cheaper and easier to obtain. I picked up a flimsy project enclosure from Radio Shack to house the wiring and output jack. I got one that’s big enough to provide room for expansion. Should I get the urge to install a small amp or effect circuit, I’ll have plenty of room. Right now I’m just happy the damned thing works. 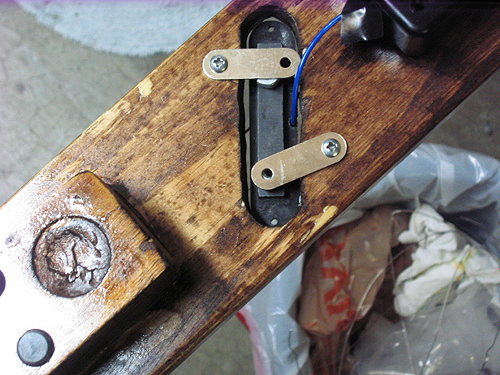 These last two pictures are for Khate, who asked to see how the pickup was installed. I don’t have a router or a jigsaw, so I had to use my drill and Dremel to cut the hole for the pickup. It turned out to be too big and it looks really sloppy. I’ve got a pick guard coming in the mail that I intend to cut to size and install to help clean up the look a bit. Until the pick guard comes and I can get the pickup mounted the proper way with its springs and screws, I’ve got two metal brackets screwed to the bottom of the board to keep it from falling through. 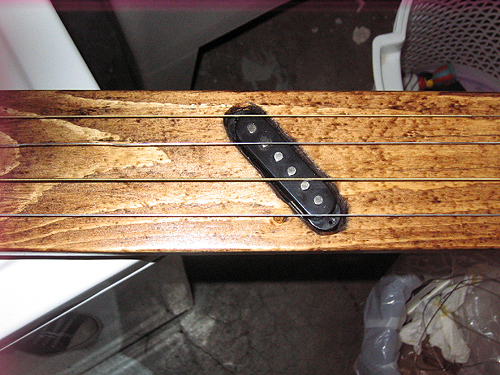 In order to get the pickup high enough to be effective, I added some nuts as spacers. No DIY gear post is worth a hoot without a sound file to accompany the pictures. For the sake of our venerable friend, SIGHUP, the first half of this demonstration completely lacks all effects. The second half thumbs its nose at SIGHUP and demonstrates how the ATG Mini brutalizes dark ambient when drenched in reverb and delay. I’ll warn you that it gets loud at times, because I didn’t bother to check the levels while I was performing. I think this is going to become a standard piece in my live rig. It’s too awesome not to. I’m not sure if I ever updated you all with the latest modifications to the ATG Mini, so I took some pictures of that as well. This is mostly done to aid in performing the ATG with a bow. 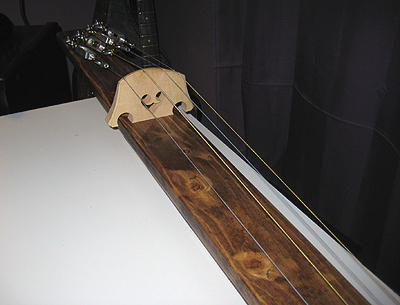 I picked up a bridge from an upright bass, and modified it to fit the ATG. 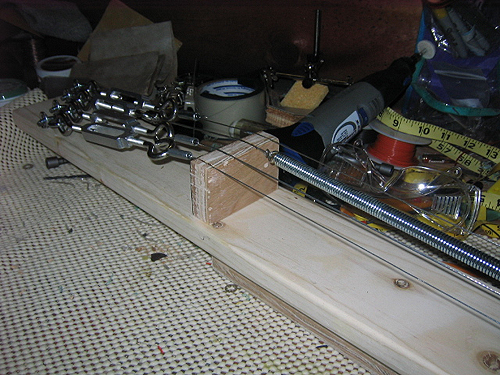 I also made some slight alterations to the bridge at the other end of the instrument, to help crown the strings for easier bowing.